Estriol is one of the three principal estrogens produced by the body. Estriol was originally thought to have little significance due to its weak estrogenic activity when compared with estrone and estradiol. Further research has found that its weakness may very well be its strength. Studies continue to suggest that the lower potency estrogen estriol does not increase the risk of hormone dependent cancers of the breast or endometrium. Estriol having a weaker estrogenic effect means that is easier on the body and regulation is milder. Studies continue to suggest that estriol reduces symptoms of menopause, such as vaginal atrophy, dryness, hot flashes and hair loss, with better safety compared to the more potent estrogens. Studies have also shown this weak estrogen to have positive health benefits when looking at weakness in the smooth muscle of the urethra (urinary incontinence), cardiovascular and bone health and even multiple sclerosis. Relevant link to over 150 independent research articles on estriol. Menopausal women often suffer due to a drop in estrogen in comparison to testosterone, which may not decrease at the same rate. The result is a net excess of testosterone, contributing to menopause symptoms, hair loss on the head and hair growth in unwanted areas due to falling estrogen which can be restored with a bio identical estrogen. One of the questions that most perplexes scientists is why and how menopause is experienced so differently around the world. There are other cultures where women experience minimal and often no menopausal symptoms like hair loss, insomnia, hot flashes and vaginal dryness and athropy. Also linked to this issue is the fact that in some parts of the world, notably the Far East , breast cancer is not the major killer that it is here in the West. For example, the West seems to have a breast cancer death rate that is six times higher than that of women in Japan. The interesting thing is that as soon as Japanese women moved to the West their breast cancer rate is elevated to the same rate as Western women. As a result of this, scientists have studied the benefits of a group of plant substances known as phyto/(plant) estrogens. These naturally occur in certain foods such as soy, legumes, lentils, chickpeas, flax, clover, and grape skins. Soy phytoestrogens contains two flavonoids, genistein and daidzein, and studies have shown that they are chemically similar to Tamoxifen, which is the drug to prevent a recurrence of breast cancer. These very weak plant estrogens latch on to the estrogen receptors in the breast and other sensitive tissues and they stop the more powerful carcinogenic estrogens from getting through. So they have a protective effect, as well as helping to balance hormones which are responsible for menopausal symptoms such as hot flushes, sweats, hair loss and vaginal dryness and athropy. Phytoestrogens have also been studied extensively for their effect on lowering cholesterol, so they can have protective effects in terms of heart disease, which is largest health concern for women during menopause. At the moment there are more than 4000 articles about phytoestrogens being published ever year. One 1998 study published in Obstetrics and Gynecology looked at the effects of soy capsules against a placebo (dummy tablets given to part of the group). Within four weeks there was a significant reduction in hot flushes and sweats in women taking phytoestrogens. Other studies have shown that these phytoestrogens reduced and reversed menopausal hair loss in women. Women who have had a hysterectomy and have undergone natural or surgical menopause who do not wish to take synthetic estrogen replacement but who are having problems with hair loss, vaginal dryness, hot flashes or insomnia. Women who have not had the uterus removed but have undergone natural menopause and do not wish to take any synthetic estrogen replacement. Women who are perimenopausal who are not taking prescription estrogens or birth control pills but who are having hot flashes, anxiety, hair loss, vaginal dryness and wish relief from the effects of menopause. Women who are having hormonal imbalances shown by exhibiting hair loss, hot flashes, insomnia or night sweats. Estriol is an all natural estrogen and is easily and quickly absorbed into the body so you can apply it almost anywhere with success. Apply and massage into your skin until it is noticeably absorbed. 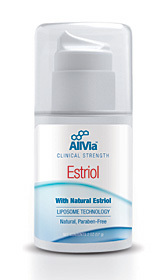 Estriol should not be applied over top of other body creams or perfumes as they may interfere with proper absorption. Apply once or twice a day for 2 weeks if symptom relief is sufficient you may decrease to once daily. Adding phytoestrogens such as; soybean, oats, barley, alfalfa, wheat germ, rice, Flax seed & nuts to your diet will also help and you reduce your dosage to once daily.